This book is the result of a study of Gija plant and animal knowledge conducted by biocultutral knowledge custodians with a linguist and biologist are presented. Gija names and uses of plants and animals, specific names and common English names of 215 plants and 247 animals are included. Language, land, stories and songs are closely entwined in many societies around the world. 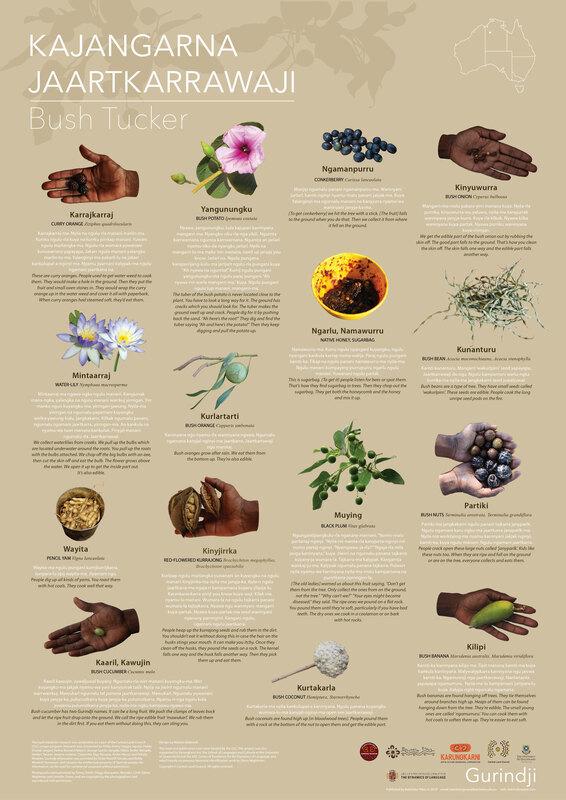 The Gurindji bush tucker poster provides cultural information in Gurindji and English about local edible plants. 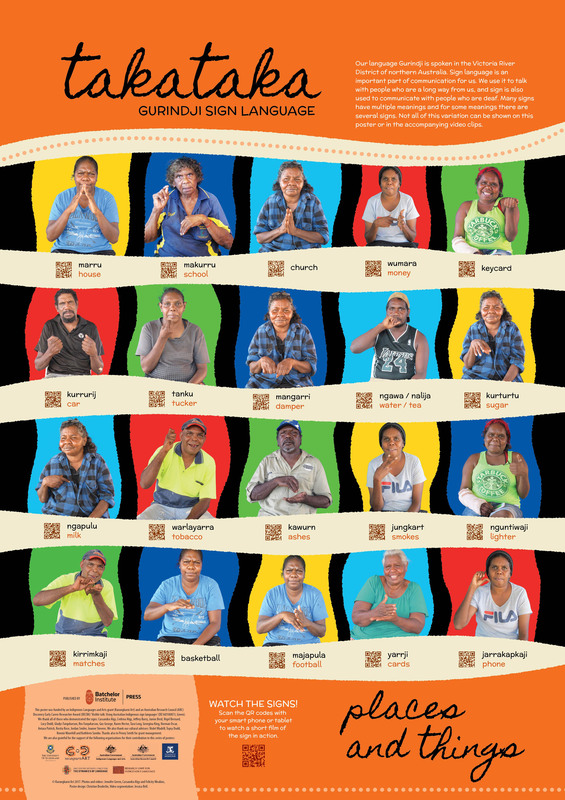 It was produced at Kalkaringi by the Murnkurrumurnkurru Ranger group with Felicity Meakins and Karungkarni Art as a part of the Central Land Council (CLC) ranger program. 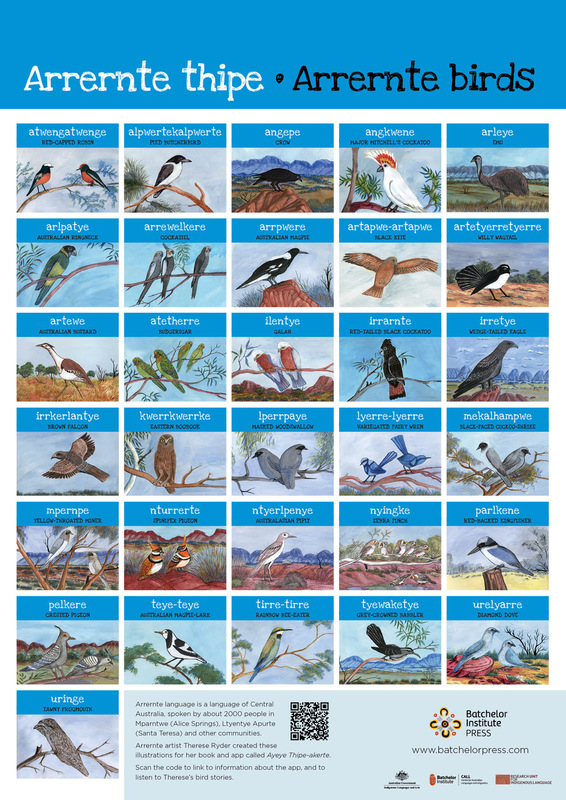 This poster shows the Arrernte names of birds from Central Australia. The images on the poster were painted by Therese Ryder. This poster is a companion to the book Ayeye Thipe-akerte written by Therese Ryder and published by Batchelor Press in 2017. 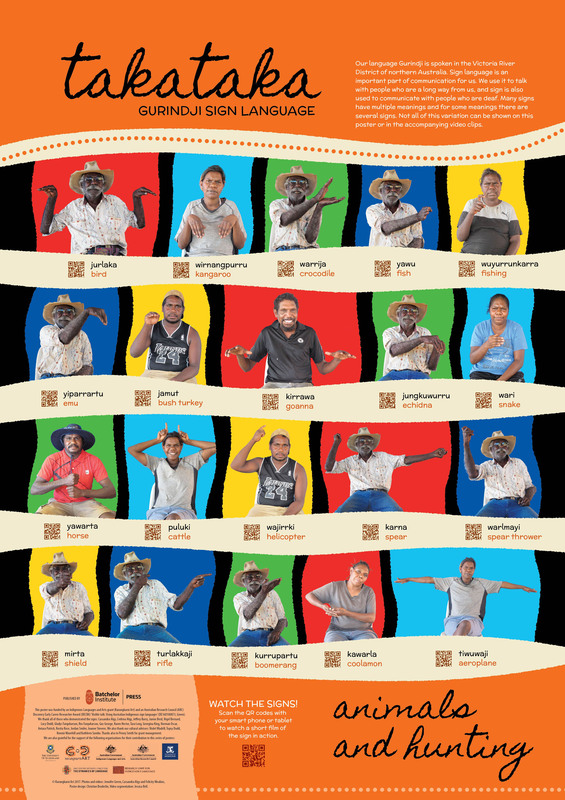 Our language Gurindji is spoken in the Victoria River District of northern Australia. 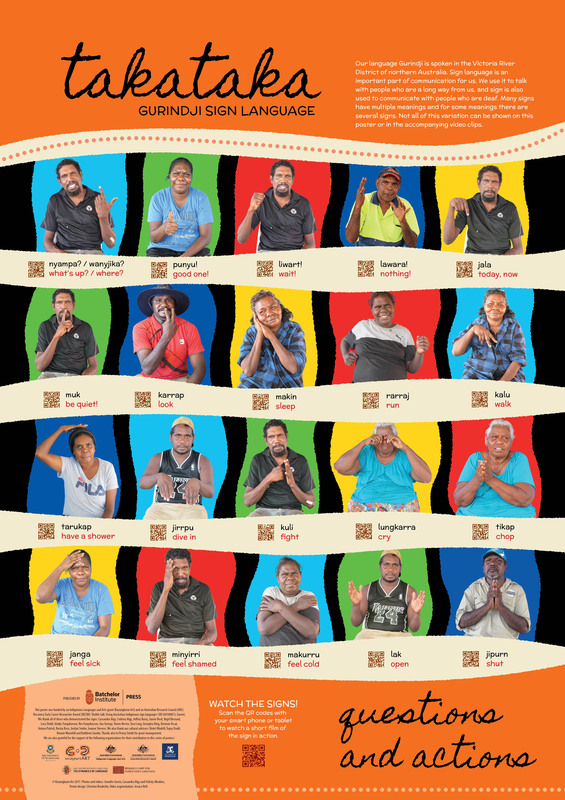 Sign language called ‘takataka’ is an important part of communication for us. 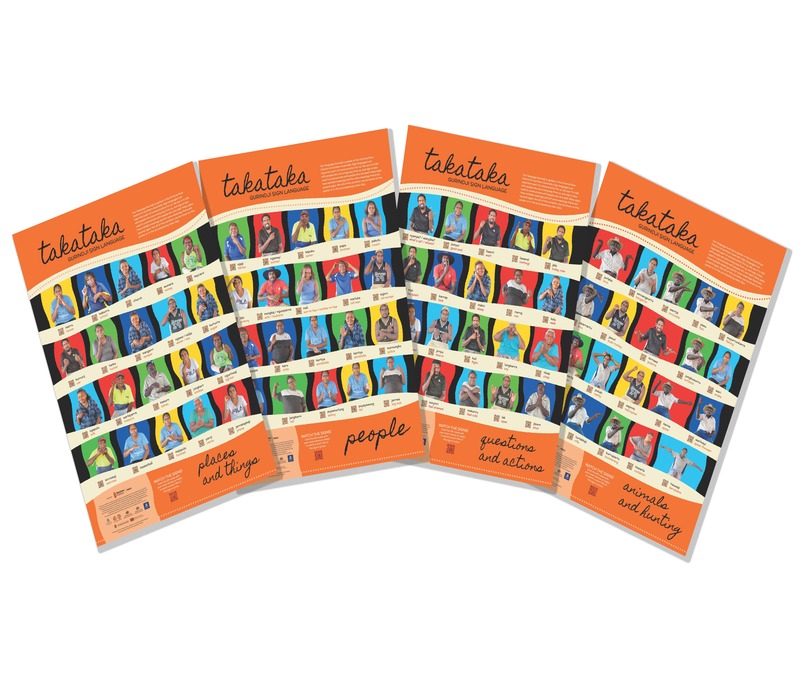 We use it to talk to people a long way away, and sign is also used to communicate with people who are deaf. Here are some of our signs! You can also watch us demonstrating the signs through the QR codes with your mobile phone.